1 Time from device power-on until copy ready (not print reservation). 2 Time from device power-on to when copy icon appears on the main menu of touch-panel. 5 For more information, including compatibility, please visit https://www.usa.canon.com/mobile-app. 8 Other operating systems and environments including AS/400, UNIX, Linux and Citrix may be supported. Some of these solutions are chargeable. SAP Device Types are available via the SAP Market Place. For more information, contact your sales representative. 9 No charge for this solution; however activation is required. 10 0.41 W sleep mode not available in all circumstances due to certain settings. Designed to deliver high productivity, productive scanning, and ease of use, the reliable and compact imageRUNNER ADVANCE 615iF II multifunction printer produces crisp text and consistent images at up to 65 pages per minute. 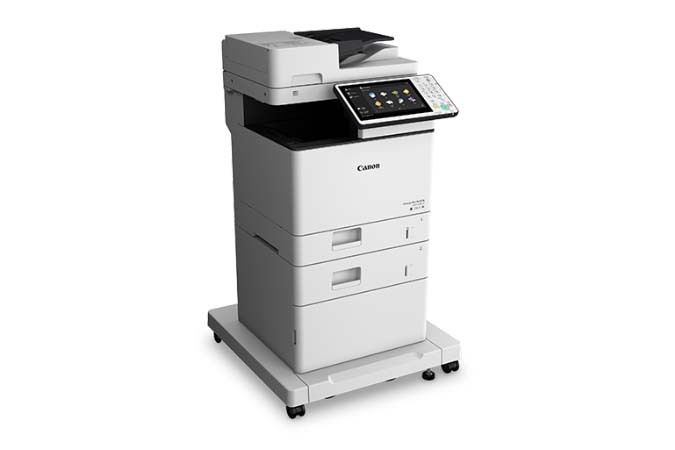 As part of Canon’s advanced line of multifunction printers, the imageRUNNER ADVANCE 615iF II presents an ideal solution for small businesses or workgroups within large fleet environments that require printing and copying on letter- and legal-sized paper. Built on the imageRUNNER ADVANCE platform, this model delivers consistent ease-of-use with Canon devices, and outstanding performance inside and out. The imageRUNNER ADVANCE 615iF II multifunction printer comes standard with a single-pass duplexing automatic document feeder for impressive scanning speeds of up to 100ipm (300dpi). The large and intuitive 10.1” user interface provides smartphone-like usability and is the same display used on the other third generation imageRUNNER ADVANCE models. The imageRUNNER ADVANCE 615iF II is designed to deliver Canon’s signature reliability and easy maintenance. The All-In-One Cartridge is designed for long life and easy replacement, helping to decrease the need for service intervention and increase uptime. Flexible paper handling options include a high capacity paper supply and an envelope cassette. The imageRUNNER ADVANCE 615iF II model provides workplace environments with a reliable and easy-to-use solution delivering quality output and a comprehensive standard feature set, whether used as a stand-alone multifunction printer or as part of an entire fleet of devices.